The purpose of this guide is to give you the necessary tools to safely make, prepare, and distribute gluten-free hosts to your gluten-free members. Attention to detail is critical for success in the gluten-free lifestyle. It is not surprising considering lives are turned upside-down by something measured in parts per million [yes, parts per million]. Please keep an open mind about the information presented here. It can be hard to comprehend that "The Staff of Life" can make someone sick. Science proves it to be true for about 3 million with celiac disease and an estimated 17 million with gluten sensitivities; just in the USA alone. 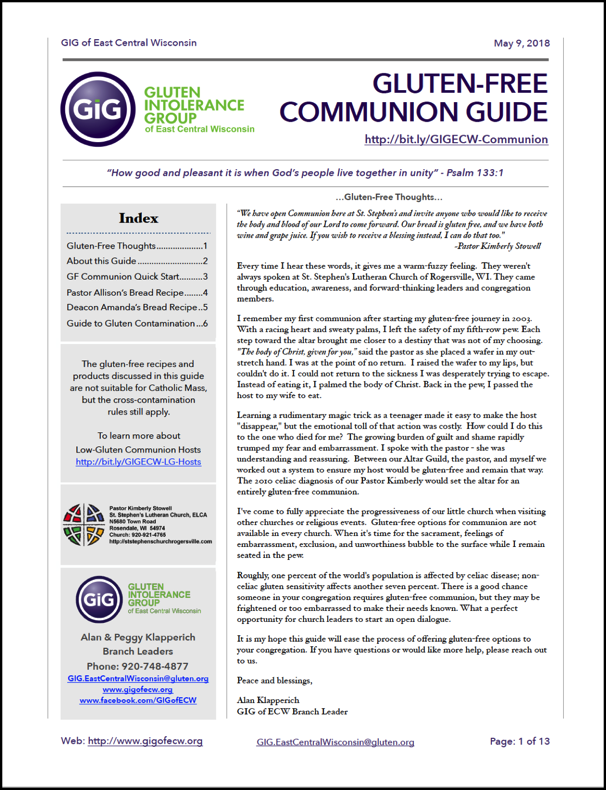 In this guide, you'll find information on gluten, how to eliminate gluten cross-contact, several recipes for gluten-free hosts, and links to commercially available gluten-free hosts. 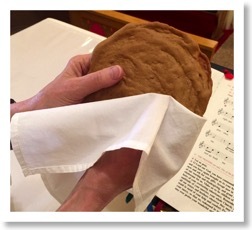 If you have questions or desire additional help in instituting a gluten-free communion in your house of worship, please reach out to us. 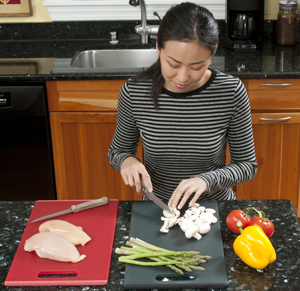 Basic kitchen safety rules tell us that we need to separate ready-to-eat foods from raw meats, poultry, seafood, and eggs - and to use separate cutting boards and utensils to reduce the risk of food poisoning. The same rules apply to gluten and gluten-free foods - they must be kept apart. Even though a recipe may use gluten-free ingredients, the food must be appropriately prepared, so it remains gluten-free. If you are making meals for a gluten-free guest, you must be mindful of gluten cross-contact. This guide will help you to understand and prevent gluten cross-contamination. Before you start you need to know a few basics. Gluten is the generic term for the proteins found in grains. The proteins found in wheat, barley, rye and commercial/mainstream oats (think Quaker Oats) are not acceptable for those following a gluten-free diet. Commercial or mainstream oats contain gluten due to how they're grown, harvested, transported and processed. Certified gluten-free oats are acceptable for some celiacs. Just about everywhere! Bread, pizza, cake, cookies, crackers, pasta, cereal, soups, sauces, beer - just to name a few foods. Many processed foods contain gluten in some form or another. It's very prevalent in the Standard American Diet. Gluten provides the structure, the framework – it holds everything together. It gives that chewy texture that is desirable in many foods like bread & pizzas. It also makes a lot of people sick. Think of gluten as a poison. How much arsenic would you like in your food? Very good, I thought you'd say zero. Not only must the food be gluten-free, but it also must not come in contact with any gluten. The concept of “a crumb will hurt you” is hard for people to understand because it involves minuscule amounts. How small? Literally, a small crumb. A multicenter, double-blind, placebo-controlled, randomized study has shown that many celiacs can safely consume up to 10 milligrams of gluten per day. (10mg = 1/8th of a teaspoon of flour, or 18 slices of gluten-free bread). Yes, crumbs matter! Here's a perfect illustration. An average grain of rice weighs 28 milligrams. Now, divide that grain into 3 pieces. Those pieces are 9.33 milligram each – just under 10 mg limit. Many can not consume even 10 mgs of gluten without getting sick. Many in the gluten-free community strive for and attain ZERO gluten. ZERO gluten should be the ultimate goal for everyone following a gluten-free diet. Condiments (spreadable) – jars of peanut butter, mayo, butter, margarine, jelly, etc. These containers are large gluten magnets due to "Double Dipping." Purchase and use new products. Dispose of contaminated products or clearly label as not gluten-free. Double dipping is strictly prohibited. Master the fine art of “Gob Dropping” or using a couple of spoons & knives to accomplish the task. Purchase squeezable containers when possible. Any foods like flours, starches, white or brown sugars, etc. that frequently use shared utensils with gluten. Do not re-use a measuring cup after it contains gluten flour/ingredient. Thoroughly wash it, or use a clean one. Same goes for stirring and serving. Always use a clean utensil for gluten-free foods. Have dedicated utensils for only GF use. Brown sugar has another risk factor. Some people will put a piece of bread in their container to keep the sugar soft. Breadcrumbs contaminate the sugar. Deep fry oil or pasta water. Do not deep fry gluten-free foods in oil that previously fried gluten-full foods. Use fresh oil, or fry GF foods in fresh oil before frying gluten-full foods. Do not boil gluten-free pasta in water that previously cooked gluten-full pasta. Use fresh water for GF pasta. Silverware drawers – take a look in there – lots of crumbs! Clean out the entire drawer and re-wash the utensils. Do the same for any other drawers too. Kitchen surfaces – whenever preparing gluten-free food, make sure work areas, and hands are clean and free of crumbs. Dry wipe the crumbs first with a paper towel. Use hot soapy water to wash then rinse with fresh, clean water. Bleach will not do anything to gluten to make it safe. It's best to designate a gluten-zero prep area where no gluten is allowed. Toasters - if you’ve ever toasted gluten products in it, there is no way to clean it effectively. Do not use a toaster that has contained gluten. Purchase a new one. Toaster bags are an option. Toaster Ovens with Fixed racks – line with foil. Works well for heating, baking, but not good for toasting. Toaster Ovens with Removable racks – purchase and mark new rack for GF use. Foil existing rack or clean. Ovens and Convection Ovens (they circulate the air inside the oven to shorten cooking times). If you can not bake gluten-free items separately from gluten items, always place gluten-free items on the top rack - above gluten items. Either turn off the convection feature (circulated air) or make sure you have a tight-fitting lid on your gluten-free dish. Cake pans – these pans typically have a lot of very deep cuts/grooves in them. Purchase new or use disposable aluminum cake pans. Gluten can get stuck in deep cuts. Line with parchment paper when baking GF cookies. Have dedicated GF cookie sheets. Any utensil, pot, pan, dish, etc. that has come in contact with gluten. They must be clean before gluten-free use. Do not reuse these items for gluten-free foods without thoroughly washing them or grabbing a clean one. For example: Don't use the gluten pasta salad spoon to serve the gluten-free pasta salad. Those living in a mixed house should have dedicated gluten-free utensils, cutting boards, colanders, etc. It helps to have them color coded. Consider using the color red for gluten-free. Colanders/Strainers/Flour Sifters – Pasta/gluten often get stuck in the small little holes and slits, thoroughly cleaning them is a nightmare; if not impossible. Wooden utensils/boards/rolling pins – Porous items can harbor gluten. Purchase new colanders, flour sifters, wooden items, cutting boards. Replace if there are any cuts or scratches on the surface, do not use it, gluten can get caught. As long as it can be well cleaned, it should not be a problem. Cast iron skillets – the “seasoning” develops from years of use. Replace. Some people re-seasoned their old skillets by heating them to 600-700 degrees for 30 minutes to burn off any residue. Ceramic bake or cookware (Pizza Stone) – it's porous..
Foil it or purchase new. Cleaning porous items is difficult. Use paper towels to make the first pass on clean up. Then use clean/unused items to finish cleaning. Due to the holes in sponges, dedicate one to gluten-free. Cleaning them may be a messy job. It might be time to replace the grates. If cleaning or replacing isn’t an option - grill gluten-free items on aluminum foil. Shared bowls or bags of your favorite GF snack food. Shared dips & sauces. They are crumb magnets. Snacks must be poured out into an individual bowl before contamination. Have a marked & dedicated gluten-free chip dip bowl. Family-style or Buffet-style service - A gluten-free nightmare! Inevitably someone will grab a spoon from the pasta salad bowl for the gluten-free coleslaw. If 100% gluten-free buffet-style isn’t possible, separate gluten-free foods from the gluten-full foods. Color-coded containers & utensils help lessen the contamination risks. Have a “Gluten-Free” sign posted. If no room for separate gluten-free/gluten-full foods, hold back some of the gluten-free foods before they are placed out for service. Tell your gluten-free guest where to find these items. Invite gluten-free guests to go through the line first - before any of the gluten-free dishes have a chance to get contaminated. TV Remotes, Phones, Keyboards, Mice...anything that has been touched by glutened hands. If you have touched gluten - wash your hands before touching anything else. Clean these items the best you possibly can - it's tough. Can you destroy gluten by heat? Store gluten-free foods on the top shelf of pantry or fridge. Gluten will not fall into gluten-free food. Store GF items in well marked, sealed containers. Do not purchase food from bulk food bins. Highly contaminated. Purchase only GF Certified grains & flours. Including oats - no commercial oats (think Quaker Oats). Flour particles can remain airborne for up to 24 hours. Only prepare gluten-free foods after a thorough cleaning and before gluten foods. People with celiac disease are inadvertently consuming more gluten than they realized. Keep in mind, medical experts recommend gluten consumption be kept below 10 mg per day (a crumb approx. 1/3 of a grain of rice). Participants were (on average) consuming between 15 and 40 times the recommended limit. 244 mg is approx. 8.5 grains of rice. While these numbers might explain why an estimated 30% to 70% of celiac patients still experience celiac-related symptoms while following a gluten-free diet, it raises many more questions. How much gluten is coming from cross-contamination? 04/22/17 - Removed bad link. 04/29/15 - Added "A Day in the Life: Living in a Mixed House". 04/22/15 - Updated GIG links and updated Printer Friendly version.